Good morning, Friends! I hope you all are having a fabulous week! It does seem to be going very fast! It might be a little shocking to Nick to have to go back to school on Monday! He's been having so much fun on his break! I think I am ready for him to go back so I can get some things done around here! Yikes! I do need to do some stamping!! Looks like it might rain today so that might help. Today's card uses the new gold products. I had fun creating this one! Thanks for stopping by! 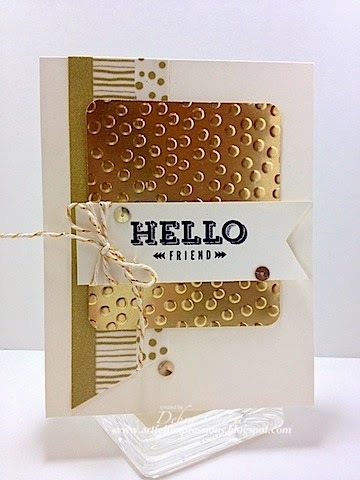 I hope you are enjoying the Create with Connie and Mary Card "Create"tions edition that launched earlier this week! If not, you can still sign up and see all the wonderful creations that have been shared so far! My card set was posted earlier this week! Thank you for your kind comments on my cards! Need more reasons to sign up? 3 weeks of FABULOUS card ideas - 18 different sets (not including our two Preview sets). Each SET is presented with 4 cards...for a total of 72 EXCLUSIVE card ideas NOT SEEN ANYWHERE ELSE! Each Saturday we will each do a small favor as a bonus item using the same set we use during the week. These WILL be displayed publicly but only subscribers will see the cards! 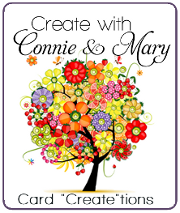 The Create with Connie and Mary Card Create-tions session runs from March 30 thru April 19! Sign up for only $19.95!